Usually I don’t get too emotional on my blog posts, but today, as I write this, I wanted to do something different. Over a year and half a go, a month after my brother’s death, I was in a place I had never been in. I was constantly stressed to the point that I would have terrible panics of hot flashes; and I hadn’t had a good night sleep for too long, due to nightmares I will never tell a soul. One day, my mom emailed me about a pet palooza event that was going on in the area and suggested we check it out. 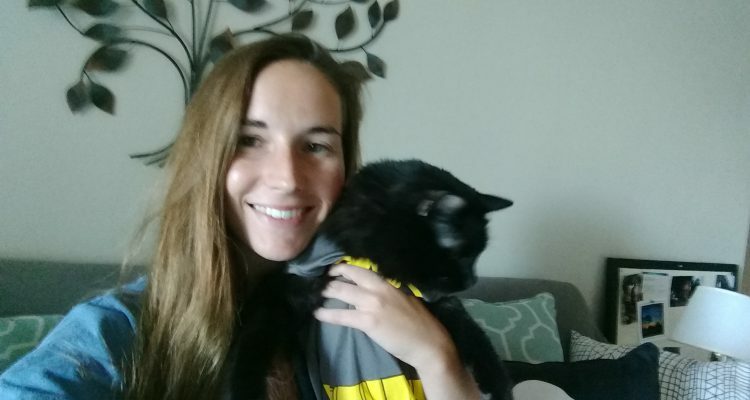 I mentioned before how I had a goal of adopting a black cat (since statistically black animals are the least likely to get adopted), but after these recent events at the time, I was honestly nervous about bringing a life into my home that I would be responsible for (since I didn’t feel I truthfully was altogether myself). I decided to go and check this thing out anyway (I didn’t have any other plans), and I’m glad I did, because little did I know, that there was a black fluffball that was sitting in a cage waiting to steal my heart. The next thing I knew I was at Petsmart, buying cat toys and a carrier in order to bring home a cat named Hililaya. I’m not going to lie to you, the first few weeks were rough. I would get a scratch here and there; I still continued to get no sleep, due to being bopped on the nose in the middle of the night for pets. I didn’t know what I was doing, and the adult cat clearly never responded to her name; so with some minor adjustments and a name change, we finally began to form a bond that I only realized now really changed me.